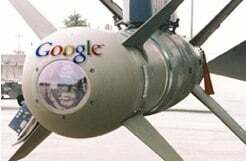 Search Results Go Boom: Does the Google Bomb Work? A disgruntled employee built a Web page that’s very negative about my company. Now when you search for my company’s name, his page comes up before mine. I think this is hurting my business. Is there a way I can push his page down so fewer people see it? Dealing with publicity from unhappy customers and employees is a challenge as old as commerce itself. Even a whisper of “Don’t get your stone tools sharpened by Ugg, he’s hard to deal with” can absolutely kill a Cro-Magnon’s revenue. Fortunately, instead of an ugly personal confrontation featuring stone tools and a high likelihood of maiming, we can settle our differences remotely using a keyboard and our evolved wits. If you are sufficiently motivated, you can indeed influence the ranking of another Web site within search engine results pages. Known as “Google bombing” the practice was first popularized in the 2004 Presidential campaign when a search for “miserable failure” brought up President George H.W. Bush’s official White House biography. Google bombs are detonated when a group of Webmasters create links to a particular Web page using the same anchor text. Anchor text is the actual words that form the link (usually underlined). If “This is the best column ever” was a Web link, “best column ever” is the anchor text. Search engines pay close attention to anchor text because it tells the engine the topic of the page on the other side of the link. It’s important to manage the anchor text of links pointing to your site. For example, links that read “Convince and Convert” aren’t as useful as “Internet marketing consultants: Convince and Convert” because we’re already number one for “Convince and Convert” and don’t need the extra help provided by the anchor text. Historically, Google bombs have been used to boost search engine rankings, not diminish them. For example, adding a bunch of links from other sites pointing to your Web site may indeed move your site above the malingerer in question. However, Google’s January, 2007 algorithm update closed the bombing loophole for the most part. Anchor text that is too consistently similar, combined with a sharp increase in links pointing to a site now constitutes a red flag that nullifies those efforts. Google is starting to remind me of my junior high girlfriend. I keep trying different tactics, but they see it coming a mile away and shoot me down. In your case, you’re looking to influence a Web page on the negative side by tarnishing its reputation. Like Lindsay Lohan, but without rehab. Theoretically, this is possible by turning the bomb upside down. By recruiting a digital posse to “get a rope” and add links to the offending page from outrageously sketchy and off-topic sites, you may be able to water down the page’s relevance for the search terms that are important to you, pushing it down the results page. Because you wouldn’t be using the same anchor text, but rather a wide variety, it may fly under the radar. If it will work, it will work mostly for Google, because it cares much more about link quality than does Yahoo! or MSN. They care more about total number of links, so this attack could actually help your foe on those engines. As mentioned, Google monitors link acquisition trends, so this will only be effective if the dicey links are added slowly over time like stirring rancid milk into cake batter.